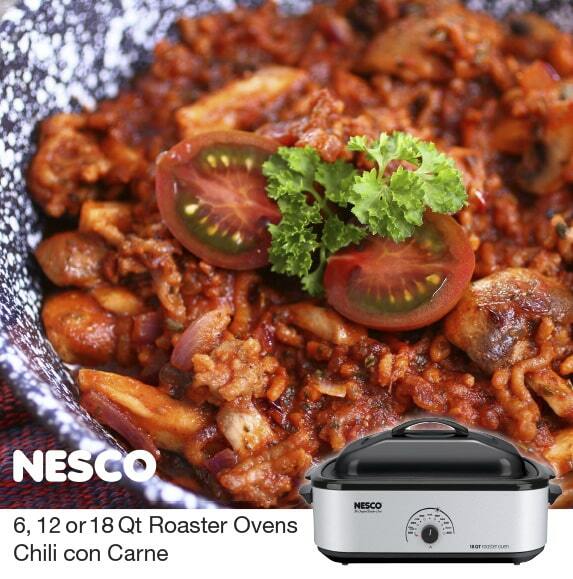 A rich wholesome batch of Chili Con Carne made in your NESCO Roaster Oven is prefect for when friends come over for the big game. Made with beef or turkey, its comfort food goodness will be appreciated by all. Preheat Nesco® Roaster Oven to 425ºF. Brown ground beef, pepper and onion; drain fat with a baster. Stir in tomatoes, bean liquid, tomato sauce and seasonings. Cook until boiling around edges. Reduce temperature to 300ºF. Cover and simmer for 1¼ hours. Stir in beans. Simmer, stirring occasionally for about 15 minutes. Try some and let us know what you think. Also, let us know some of your favorite chili recipes.